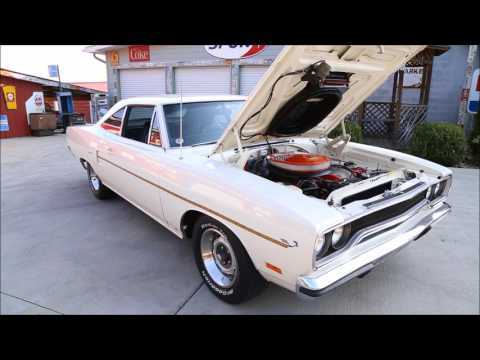 Up for sale we have a 1970 Plymouth Road Runner 440 Six Pack. This is a gorgeous car that has been locally owned for at least 15 years that we know of. It is a factory 383 car that has been upgraded to the 440 Six Pack. We believe this car has a lot of factory paint on it, and down the sides are laser straight. All the door, hood, and trunk gaps are excellent with all the fit being near perfect. The paint is done in Alpine White that's accented by the Road Runner Dust Trail side stripe and the Performance Hood Treatment. This is a factory Air Grabber Hood car that is working. Some of the chrome and stainless appears to be factory with light aging, but the Bumpers both appear to have been rechromed. All the glass is factory Mopar glass with exception of the windshield which has been changed. To finish off the look it's sitting on a set of 15” Rallyes with rings, caps, and BF Goodrich Tires. On the inside, it also appears to have a lot of original parts and is done in the factory color scheme. This is an original bucket seat car that has had new covers installed and the padding redone. The center console has the wood grain trim and the console lights are working. The door panels are in excellent condition with the hardware showing some light aging. The carpet and headliner are in very good condition with the visors and hardware appearing original. Looking at the dash all the gauges are working except for the clock. Even the original radio is working, but the sound system has been upgraded with a Kenwood Amp that runs the Kicker speakers and sub. And of course, we can't forget it has the working Beep Beep horn! Under the hood the inner fenders and firewall are done in body color. The engine has been upgraded to a '70 Model 440 engine that's set up with the painted aluminum Six Pack Edelbrock intake with Holley Carbs. It's dressed in the factory style breather for the air grabber hood. The engine is mated to a 727 Automatic Transmission and the Sure Grip 8 ¾” Rear End with 3.23 gears. For Exhaust, it has manifolds with dual exhaust that features X Pipe and Super Turbo Mufflers. This Road Runner comes with Power Steering and Disc Brakes on the front with Drums on the rear. When you look under it the floors and frame all appear to be covered in the factory under coating and look to be rock solid. When you find a classic Plymouth Road Runner for sale in great condition you don't want to pass it up. It was a back-to-basics mid-sized car with a focus on performance, appeared on the scene in 1968. By this time, the original muscle car was moving away from the former trends of cheap and fast and moving towards more features and larger price tags. The Road Runner was competitive on the market as a lower priced, basic trim model of the Plymouth GTX. As the name might make you think, Plymouth paid a pretty price to Warner Bros. to use the Road Runner name and likeness from their popular cartoon featuring Wile E. Coyote - they even took inspiration from the cartoon to develop the sound for the car's horn. Plymouth expected to sell about 20,000 units in 1968; actual sales numbered around 45,000. This placed the Road Runner third in sales among muscle cars with only the Pontiac GTO and Chevy's SS-396 Chevelle outselling it.